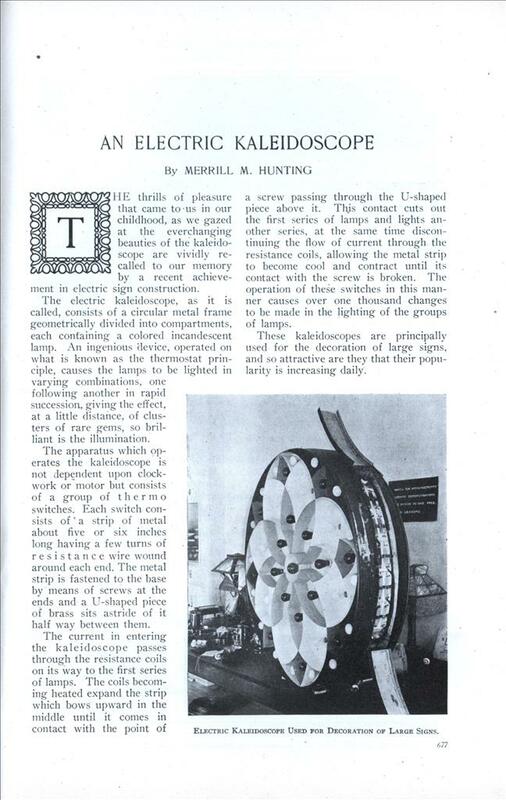 The electric kaleidoscope, as it is called, consists of a circular metal frame geometrically divided into compartments, each containing a colored incandescent lamp. An ingenious device, operated on what is known as the thermostat principle, causes the lamps to be lighted in varying combinations, one following another in rapid succession, giving the effect, at a little distance, of clusters of rare gems, so brilliant is the illumination. The apparatus which operates the kaleidoscope is not dependent upon clockwork or motor but consists of a group of thermo switches. Each switch consists of’ a strip of metal about five or six inches long having a few turns of resistance wire wound around each end. The metal strip is fastened to the base by means of screws at the ends and a U-shaped piece of brass sits astride of it half way between them. The current in entering the kaleidoscope passes through the resistance coils on its way to the first series of lamps. The coils becoming heated expand the strip which bows upward in the middle until it comes in contact with the point of a screw passing through the U-shaped piece above it. This contact cuts out the first series of lamps and lights another series, at the same time discontinuing the flow of current through the resistance coils, allowing the metal strip to become cool and contract until its contact with the screw is broken. The operation of these switches in this manner causes over one thousand changes to be made in the lighting of the groups of lamps. These kaleidoscopes are principally used for the decoration of large signs, and so attractive are they that their popularity is increasing daily. If I remember rightly, a machine of the same sort was installed in the engine nacelles of the original “USS Enterprise” model to create the “warp drive” effects.